Creating chocolate chip cookie shot cups is not easy or quick, though once you get into the rhythm, it is a fun project and the result is a tasty, edible shot 'glass.' This is a great novelty to pull out for special parties and you can make them days in advance. 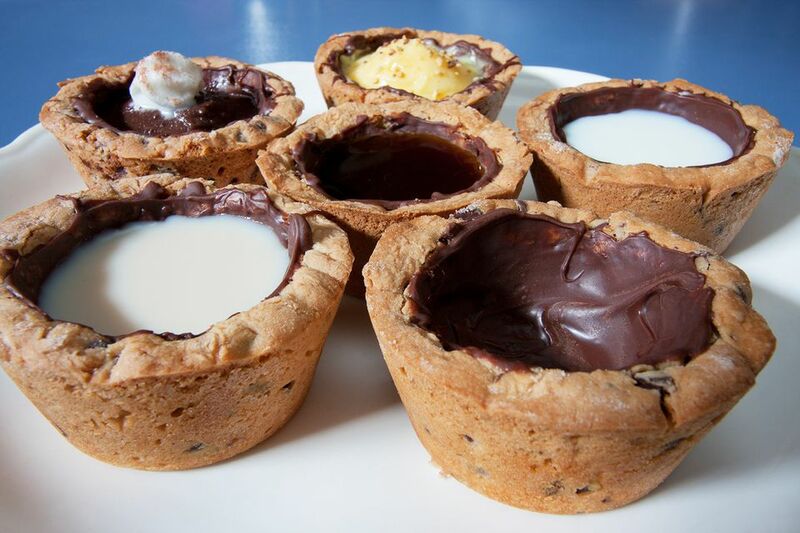 The cookie cup is created by baking chocolate chip cookie dough into the shape of a cup, then lining it with melted chocolate. The finished cup can be filled with milk (great for kids), chilled espresso, a mixed shooter, or a straight pour of your favorite liqueur - chocolate and cream liqueurs are excellent options. The goal of the cookie cup is not to create soft, gooey chocolate chip cookies, but to get the crispiness of a waffle cone in a slightly thicker, chocolate-laced shell (they're delicious on their own). To do this, I have added one cup of flour to a standard chocolate chip cookie recipe and use extra flour while working the dough into the cups (much like working with sugar cookies). One of the keys to cookie cups is the pan. You will need a hard-sided, sectional baking pan that is greased in between each batch. If you have a popover pan, use that because you will get a deeper cup. However, you can also use a muffin tin. Mini muffin tins do work perfectly for bite-sized pudding shots though they spill easily with liquid. In a standard muffin tin, the shot cups will hold about 1 ounce of liquid and they hold together perfectly so they could be refilled for another round. The crispy cookie and chocolate coating held liquid for over an hour without going soggy. I believe that they could go longer, though you should still use caution in filling the cups too early at a party. Remember that cookies rise as they bake and these cups are no exception. This does not work for our purpose because we want to create a hole to hold our drinks. The fix is to bake them most of the way, then press flat (or 'deflate') the center every two minutes until they are done. It requires a little patience, but it's not difficult and certainly worth the effort. You will want to set aside about 1/8 cup of flour in a bowl. Use this as needed while working with the dough and shaping the cups to prevent it from sticking to your fingers and tools. Gather all the ingredients and allow them to come to room temperature. Using an electric mixer, cream together the sugars, salt, and butter on low speed. In a separate bowl, combine the flour and baking soda. Add this to the main bowl and mix until well combined. Use a large tablespoon to grab a large ball of dough and powder your hands lightly with flour. Roll the dough in your hands, giving the ball a nice coat until the exterior is slightly dry. Place the dough into one of the greased pan cups (the dough ball should take up approximately 1/2 of the cup) and work it with your fingers to line the sides and bottom. The goal is to create as smooth of a cup as you can while keeping the thickness even all the way around. Try not to get the dough over the ridge of the cup. Instead, smooth and round the top edges. Continue until all of the pan's cups are filled with dough cups. Place the pan on the center rack of the oven and bake for 8 minutes. Place the pan back into the oven and bake for two more minutes. Remove and deflate again. Repeat this 2-minute cycle one or two times (a total of 2-3 deflation cycles for a total baking time of 12-14 minutes) until the rim of the cookie cup is golden brown. Remove from the oven, deflate one more time (and more often while cooling, if needed) and allow the cups to cool in the pan. Tip: If, during the first (or second) round of deflation, you find that you have too much dough on the bottom, you can remove a little with a small spoon. Simply press the remaining dough back into place to cover any holes. Once you have the cups, it is time to coat the inside with chocolate. This acts as a sealant to keep the liquid from making the cookie go soft and mushy. If you have a microwave, use it: How to Melt Chocolate. If you do not have a microwave, use this easy stovetop method for melting chocolate or melt it in your double boiler. When your chocolate is melted, spoon a small amount into each cookie cup and spread evenly around the inside. Place the coated cups in the refrigerator for at least 1 hour to allow the chocolate to solidify.